UK Disaster Recovery is the process and procedures that are related to preparing for recovery or continuation of technology infrastructure that support business functions after suffering a natural or manmade disaster. Modern organizations are dependent on their IT systems for their day to day operations and invariably this means applications and data stored remotely online by cloud service providers. The companies below offer a path to recovery to ensure business interruption is kept to a minimum. 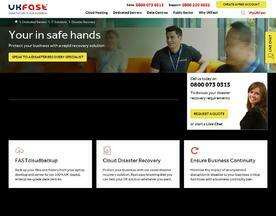 Minimise the effects of disaster and ensure maximum uptime and business continuity. Experience our industry-leading SLA, 100% network uptime guarantee and 24/7 UK-based support.